Scrooge Shanghied in Astoria, Oregon! 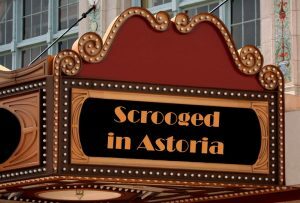 For the 10th year in a row, the Astor Street Opry Company presents Scrooged in Astoria. The company of over 26 actors transforms the lessons of Charles Dickens’ magical 19th century tale into a melodramatic 1960s style holiday television special featuring characters from Shaghaied in Astoria. Boo, hiss and cheer as the Ghosts of Christmas Past, The Big Krooke, Christmas Present, Miss Yul Macie, and Christmas Future, Saint Lucia, guide miserly “Scrooge” aka Max Krooke Jr. to change the error of his ways. Don’t miss the fun of this holiday tradition, and be warned, you’ll even be treated to singing commercials! The Miss Vivian saloon and Miss Virginia soda fountain will be open, should you need to refresh your body as well as your spirit. Don’t act like Ebenezer Scrooge or Max Krooke, Jr.! Listen to the Ghost of Christmas Present instead, and book your December stay right now at Clementine’s Bed and Breakfast. We’ll be waiting to welcome you to the inn, and we know the Astor Street Opry Company’s Scrooged in Astoria will warm your heart and fill you with holiday spirit during your stay! Tickets are $5.00 – $16.00 and may be purchased online. Although tickets may be available at the door beginning one hour before each show, seating is limited and reservations are recommended. This entry was posted on Thursday, November 10th, 2016 at 10:14 am and is filed under Clementine's Bed & Breakfast News. You can follow any responses to this entry through the RSS 2.0 feed. Both comments and pings are currently closed.